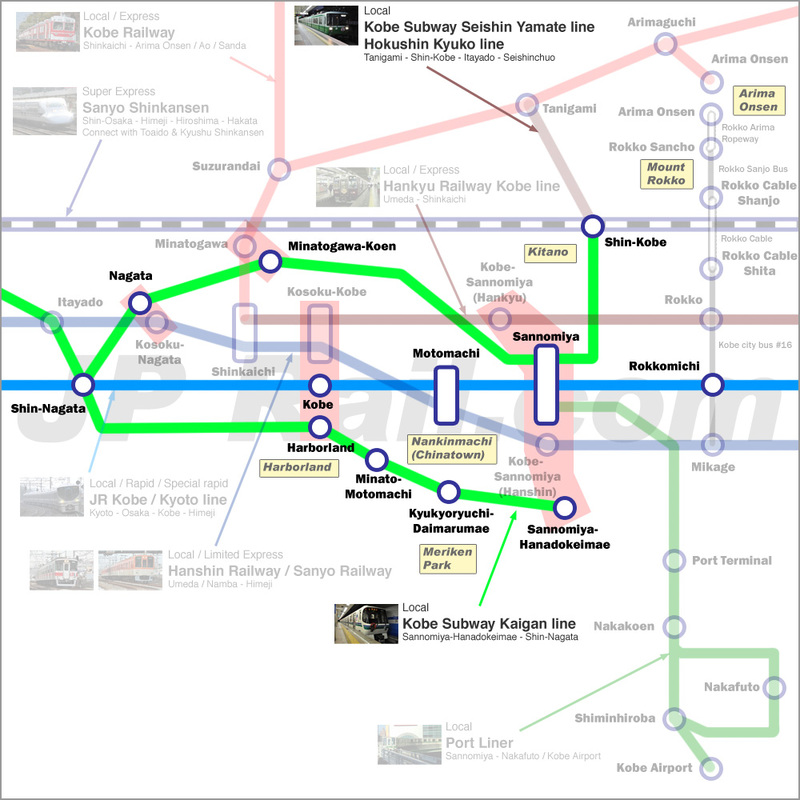 Guide to take trains in Kobe. How to choose the best route by train to get the major spots? You may be overwhelmed by train services in Kobe. Actually it is much easier to handle than Osaka and Kyoto. Most of places to see are located in downtown Kobe. Many of them can be accessed on foot from major stations directly. However understanding train system is a key to save your time. Kobe can be combined with Himeji easily. You may spend half day in Kobe and enjoy in Osaka rest of the day. For travelling in Kansai area, there are many types of deals, such as ICOCA, Kansai Thru Pass, JR Pass, Kansai Area Pass and many more. Each pass has different conditions. You have to understand which train system is covered by your pass. And also Kobe is very closed to Osaka. You may not have many chances to take a train and that means single fare may be the best option for you. 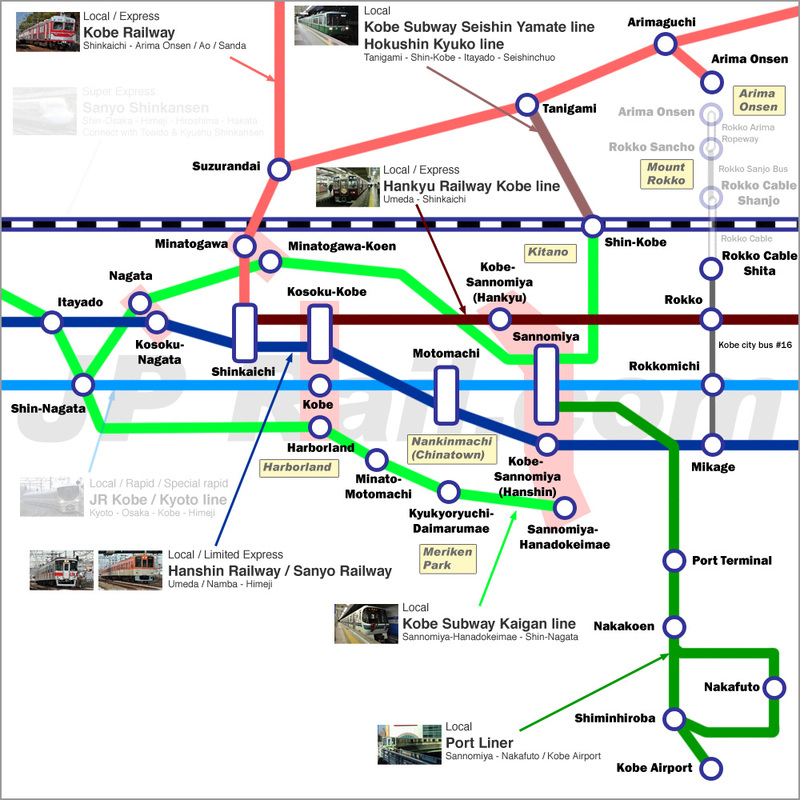 In this post, I will show you the route map and explain all train systems in Kobe. Many deals are available in Kansai area. But each pass have different coverage. I tell you about major passes and deals. You can take all trains on the map above except Shinkansen and Mount Rokko transporation, such as Rokko Cable, Rokko Sanjo bus and Rokko Arima Ropeway. ICOCA covers Kobe city bus service. You can access to Rokko Cable Shita station from Hankyu Rokko, JR Rokkomichi and Hanshin Mikage stations. This pass covers most in all passes. Only Mt Rokko cannot be accessed by this pass. It is no problem to visit other spots in Kobe. However most of spots in Kobe are located within walking distance from the stations. You may use the pass for round trip to Kobe from Osaka. For example, if you travel from Umeda to Kousoku-Kobe by Hankyu or Hanshin, single fare is 450 yen. Kansai Thru Pass is sold at 4000 yen. The cost per day is 2000 yen. If you visit downtown Kobe and harbor area, you cannot spend 2000 yen worth. I will tell you about Hanshin Tourist Pass and Hankyu Tourist Pass below. These deals are much better choice for visiting downtown area and harbor area in Kobe. These passes cover only JR conventional line’s train, such as Special Rapid, Rapid and Local. You cannot take Shinkansen and other express trains. But if you intend to visit downtown Kobe and harbor area from Osaka, single ticket is cheaper than Kansai area pass. Especially this pass does not cover any subway and bus in Kobe. It is very limited to use this pass in Kobe. If you visit Kobe from Kyoto, round trip fare is almost equal to the value of the pass. But Hankyu Tourist Pass is much cheaper than Kansai Area Pass. If you use Hokuriku Arch Pass, just take JR conventional line’s to Kobe and add other local deal or ticket as you need. 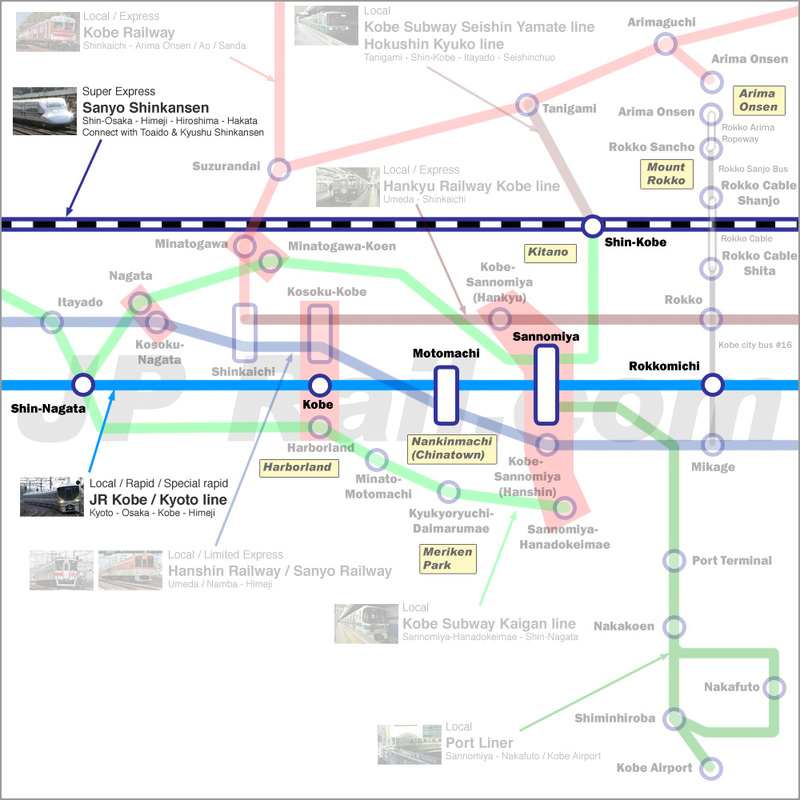 You can get either Shinkansen or conventional line trains. But Shinkansen station, Shin-Kobe is not located in downtown core of Kobe. It is one station away from Sannomiya by subway. Subway is not covered by these JR’s deals. Shinkansen is not very convenient to visit Kobe. Other conditions are same as Kansai Area Pass. Kansai Thru Pass is more convenient in Kobe, but it is enough to visit downtown and harbor area. If you think about purchasing single ticket, the following deals may be better than single fare. This deal covers only Hanshin Railway. But you can make a trip from either Umeda or Namba to Kobe. The price is only 500 yen and it is way cheaper than round trip single fare. If you want to visit only downtown and harbor area, such as, Kitano, Kobe Harborland, Meriken Park from Osaka, this is the best choice for you. Please see the link below to get the details about Hanshin Tourist Pass. This is same type as Hanshin Tourist Pass. But Hankyu Railway connects Osaka and Kyoto too. If you access from Kyoto to Kobe, this is most affordable choice. The price is only 700 yen and of course, it is way cheaper than round trip single fare. Please see the link below to get the details about Hankyu Tourist Pass. However Hankyu Railway does not have any direct train service from Kyoto to Kobe. JR has Special Rapid train and this is much faster than Hankyu Railway. If you stay in Kobe and looking for the deal, this deal may be your choice. However, as I mentioned several times in this post, many places in Kobe can be accessed on foot from major stations. Single fare may be cheaper than this pass at 1030 yen. Please make a detail itinerary and compare the fare and the deals. Bus fare is 210 yen for one ride and subway fare is 210 to 270 yen in downtown and harbor area. You have to ride more than 4-5 times a day. Unfortunately Kobe Municipality Transportation does not provide English site. Please find the details at the link below. Kobe City Loop bus has completely different exterior from regular city bus. You can find it very easily. 1 day pass can be purchased in the bus. Arima Onsen can be accessed by Hokushin Kyuko and Kobe Railway. These trains are covered by Kansai Thru Pass. However transportation to Mount Rokko, such as Cablecar, Ropeway, are not covered by any regional deals. There are some deals to cover this mountain side of Kobe. If you want to have one way trip from Arima to Kobe via Mount Rokko, Rokko Arima one way ticket is available at 1,750 yen (child 880 yen). This deal includes one way ride for both Rokko Arima Ropeway and Rokko Cablecar, and unlimited ride of bus on Rokko Mountain Top Bus. And also this deal includes the entry ticket for Kin-no-yu or Gin-no-yu hot springs. The basic price is 2,360 yen. And combination pass for this unlimited pass and return fare from Osaka or Kyoto. I would like to show you the access to major spots in Kobe. Sannomiya is the biggest downtown core in Kobe. You can get there by JR, Hankyu and Hanshin from Osaka. Shinkansen’s Shin-Kobe station is one station away by subway. Both Hanshin and Hankyu Railway’s stations are Kobe-Sannomiya. Station name is a bit different but it is same location. Port Liner depart from Sannomiya and connect to Port Island and Kobe Airport. Kitano is location between Sannomiya and Shin-Kobe. You can walk from these stations. Otherwise you can take City Loop Bus. Port Tower is the icon of Kobe. Subway’s Minato-Motomachi station is the nearest station. But you can walk from Motomachi station. Kobe umie Mosaic is shopping complex in waterfront area. JR Kobe station and subway’s Harborland stations are same location. Hanshin and Hankyu Railways Kousoku-Kobe station is almost same station. This is connected by underground path to JR Kobe station. You can get there easily from these stations. Nankinmachi is located at north side of Meriken Park. You can walk from Motomochi or Minato-Motomachi station. Port Liner connects to the airport from Sannomiya station. If you use Kansai thru pass, best way is subway, Hokushin Kyuko and Kobe railway. You may get this hot springs town by Mount Rokko transportation, such as cablecar and gondola. Night view from the top of Mt. Rokko is one of the best in Japan. Hankyu Rokko station, JR Rokkomichi station and Hanshin Mikage station are the gateway to Mount Rokko. You may also get there from Arima Onsen. You can make a circle route to combine with Arima Onssen. Hi, do you know which is the most scenic ropeway ride to mount rokko? Thank you! I have taken only Rokko Cable recently. So I cannot compare with other one. But Rokko Cable is good and recommended. Arriving by ship to Kobel July 2019. Is it possible to get the Hankyu Tourist 1 day Pass at Kobe? Unfortunately not. It’s available in Osaka and Kyoto. 3) From Mt. Rokko, I will take the cable car down, then take Kobe City Bus 16 to Hankyu Rokko Station, and take the Hankyu-Kobe line to Sannomiya. 4) After visiting Sannomiya, I will be taking the Hankyu-Kobe line back to Umeda (Osaka). 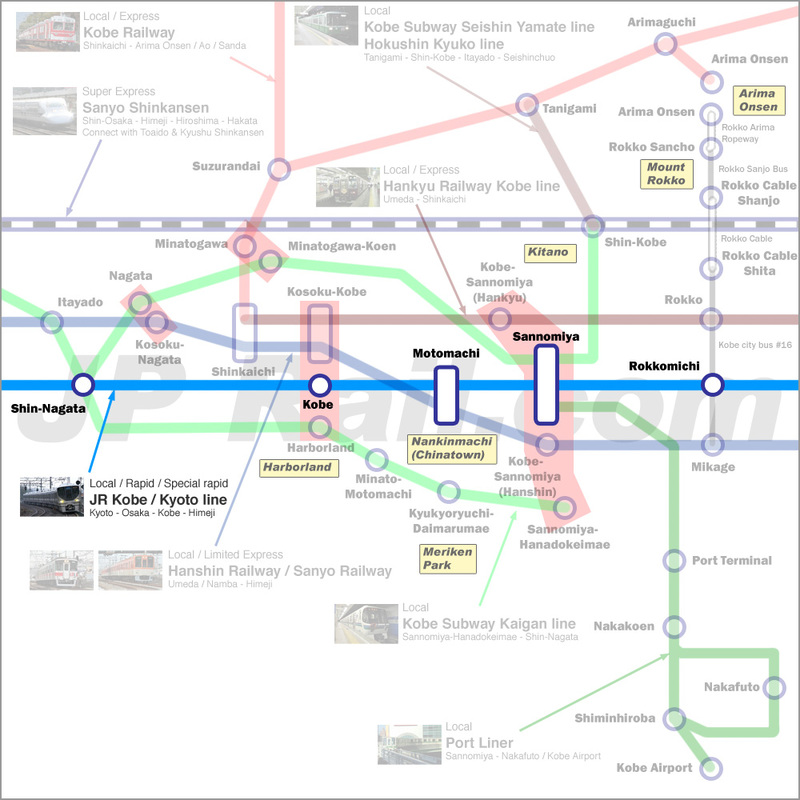 Does the Arima Rokko One Day Pass (Hankyu version) cover points 2,3 and 4 of my plan? All trips from 2 to 4 are covered by Arima Rokko one day pass. Hi Takeshi-san, this is my second (actually third) question on the website… hope you don’t mind! May I ask if it is possible to stop by Kobe on the way back from Himeji to Osaka for approximately hour? From JR Himeji, arrive at JR Kobe, walk to Kobe Harborland (for the view of Kobe Port Tower! ), go up to Nankinmachi and catch the JR train back to JR Osaka Station from JR Motomachi station? If I have more time, I would like to go to Ikuta Shrine and Kitanocho, but unfortunately that is not the case. It’s easy to add Kobe on the way back from Kobe. I cannot say how many hours you can stay there because it depends on your time in Himeji. But I think you may spend at least half days in Kobe. Next Next post: Trip to Shikoku in 2015 spring – Part 1, taking Orange Ferry from Osaka to Toyo port.